I found a nice and short video interview of Pierre Moorkens, CEO of the Institute of Neuromanagement in Belgium. Useful, since “neuromanagement” is still not very well defined: it provides some tentative directions. As it is in French, it reminded me that even if I blog in (a clumsy) English, I see no reason why a blog couln’t be multilingual. My native language is French, and it might be enriching to use it when some “neuro-” topic is available in French. Even if that seems dead obvious, I am struck by the lack of multilingual blogs on the web. So here is the beginning of the experiment: on this blog, you might read posts in different languages. J’ai trouvé une vidéo courte et sympa d’une interview de Pierre Moorkens, CEO de l’Institut de Neuromanagement, en Belgique. Utile, puisque le “neuromanagement” reste mal défini: l’interview fournit quelques pistes de développement. Comme la vidéo est en français, cela me rappelle que bien que ce blog soit en anglais, je ne vois pas pourquoi il ne pourrait pas acueillir d’autres langues aussi. Ma langue natale est le français, et ce serait enrichissant de l’utiliser quand un sujet “neuro” est développé en français. Ca semble archi-évident, mais je suis frappé par l’absence de blogs multilingues sur le web. Donc voici le début d’une expérience: sur ce blog, vous pourrez trouver des postes en plusieurs langues. A few days ago, I attended a seminar on tacit knowledge, organized in the Rotterdam School of Management. Nigel Holden was talking about the difficulty of analyzing and communicating tacit knowledge, for the good reason that tacit knowledge is by definition hard to communicate in a formalized way! The speaker and the audience came with a lot of different examples of tacit knowledge to express their points: how to ride a bike, how to test the temperature of melting iron, how to greet a visitor… what struck me then is that those examples were involving vastly different kind of experience. Riding a bike has often been consciously learned (with help of parents), while greeting someone from one’s culture has been learned unconsciously, surely by imitation. If the problem is to communicate tacit knowledge, maybe that it would be useful first to distinguish between different sorts of tacit knowledge? 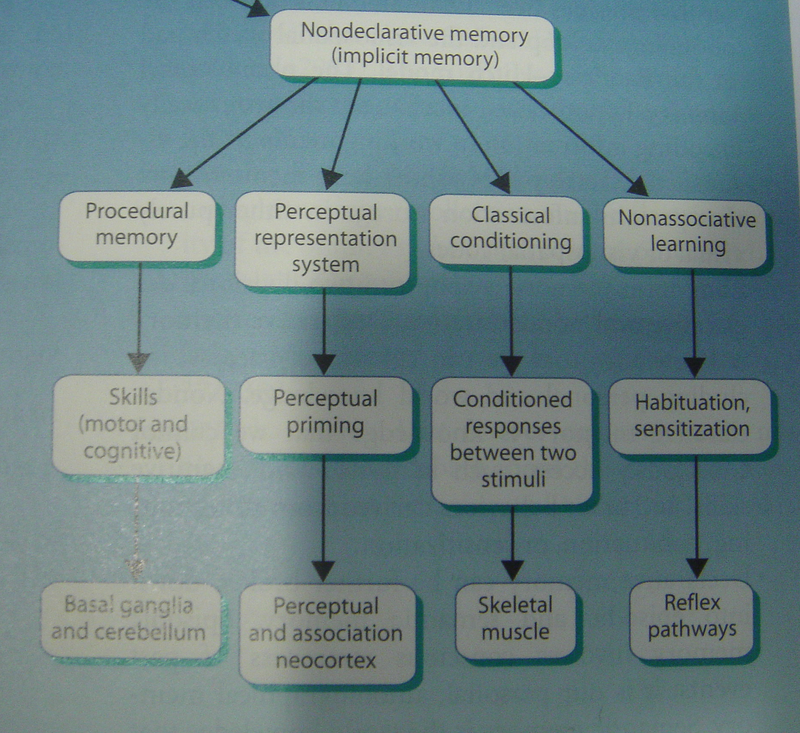 From Cognitive Neuroscience by Gazzaniga et al. (2009, p. 361). This chart shows that “tacit knowledge” covers things as different as the ability to speak a language (procedural memory) or the knowing of when the temperature is right for melting iron (perceptual priming). It is interesting because if the issue is “how can tacit knowledge be transmitted through organizations, or even transculturally”, then it would help to make a difference in treatment between these different types of things. One thing might be more learnable through careful imitation, while the other might involve repeated experience. The psychologists might have a great key to the comprehension of tacit knowledge! Whether neuro-psychologists have even more definitive answers (as the chart claims, at the bottom level), seems to be still research in progress.